Fragrance marketing creates the fourth dimension. Try it out: Relax in the woods and on fresh meadow and discover the positive effect of the dimension of scent! On our stand, our scent director, Mrs Elke Kies, takes you to a different world with natural fragrances or incisive themes – according to your wishes. Would you like to know more? Mr. Alan Anders, our expert for all technical details of ambient air care, will be happy to advise you how your scent idea can be realized! Fragrant Display– an appetizing stimulant makes your customers hungry. The purchase impulse directly follows the sampling. Ambient-Scent– cleans and enhances the air. Your customers feel comfortable and are pleasantly tuned. They are more open to buy value-added products. Point of Experience– a product or decoration related scent is released by approach or by a certain action. This surprising effect is strongly emotionalizing, increases the interest and creates long-term positive memories. Invigorator– at trade fairs, conversations are more effective when the air is cleaned and enhanced with a fresh, concentration-lifting fragrance under the perception limit. Events with Scents– create attention. They reinforce the emotional character of your message – directly into the emotional centre of your guests’ brains. We are pleased to meet you at Düsseldorf! Use the olfactory opportunities to deeply touch your customers. Increase your image, awareness, customer loyalty and last but not least your sales with the right fragrance concept. 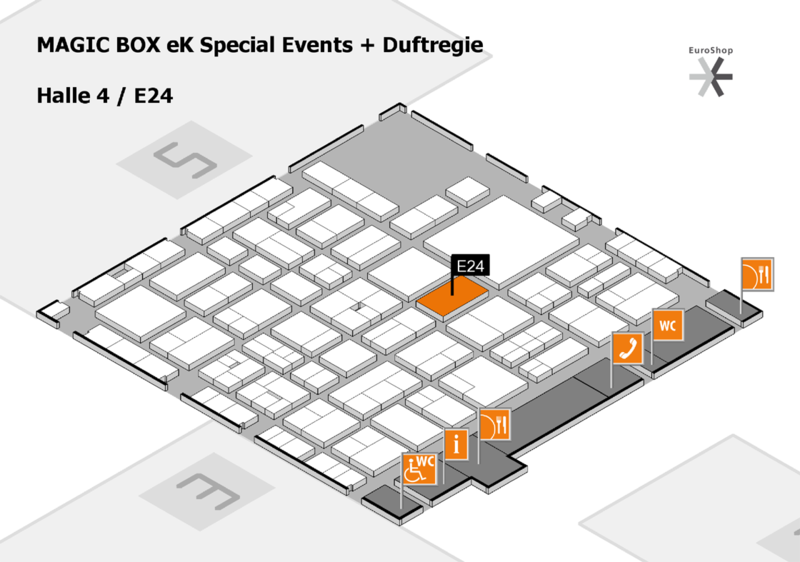 Due to the strong frequency at Euroshop, you can arrange an appointment with us in the run-up. Please feel free to use our contact form. Are you planning a project with scent?